Anderson Localization is a QM phenomenon, with no classical analog. The systems being considered in this paper are disordered conductors, meaning that the impurities occur randomly (this is not limited to non-Bravis lattice atoms being inserted, but also to random electronic and nuclear spins). In Anderson Localization, the eigenmodes are altered from extended Bloch waves into being exponentially localized3. The source of this localization is interference between multiple scatterings of the electrons by impurities (random defects in the potential). So electrons stay on their sites. When transport does occur, it is not the result of free carriers and scattering (like the Drude model’s scattering of electrons on lattice atoms), but from QM jumps from site to site (of electrons or their spins) 1. However, the potential (periodic lattice and fluctuations on it) must be time independent. In the regime of localization the interference between scatters leads to weak conductance (in fact, a conductor could be turned into an insulator if the conditions are right). For a coherent conductor having an overall conductance much greater than e2/h, the decrease in conductance is on the order of e2/h. This regime of weak localization is broken by a low magnetic field (typically less than 100 G). So one can experimentally see this effect via measuring magneto-resistance. When transport occurs, it is sensitive to phase relaxation in addition to momentum relaxation. Weak localization can be used to measure phase-relaxation length9 (pg.196). If the Localization is strong (conductance less than 2e2/h), then the phase-coherent length is comparable to the localization length9 (pg.200). Also there is a large fluctuation in the resistance if the scatters are moved or if the magnetic field or Fermi energy of the system changes; these last two change the wavelength of the electrons9 (pg.242). Finally all work is this field is because of the original work by Anderson (Reference 1), and it is cited in all other papers that discuss this subject, so his original 1958 paper is heavily used to write this review report. The original Anderson paper postulates a theorem. At low enough densities, there is no transport. The wave functions become localized to a very small region of space. 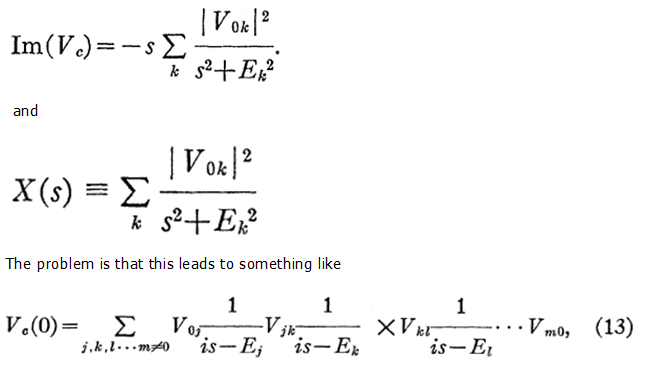 He assumes that he forces fall off faster than 1/r3 as r -> infinity. There is no contact with a heat reservoir in the model. The Anderson model is the experimental situation of spin diffusion under conditions of what he calls “inhomogeneous broadening.” Assume there are sites labeled j whose lattice spacing is periodic or random. Each site j is occupied by a spin or particle (he chooses to focus on spins which are either up or down). If a site is occupied, then the energy associated with this is Ej. But this Ej is a stochastic variable whose distribution over the band of energies is given by probability distribution P(E)*dE. It is parameterized by width W. There is an interaction between sites (which is therefore like a spin-spin interaction). The matrix element of this interaction is called Vjk(rjk). This element has a meaning of transferring spin from one site to another and is allowed to have a probability distribution. He provides an example. Consider 29Si with impurities. The mobile entries are electron spins which are placed on impurity sites (color or donor centers). The Ej’s are then the hyperfine interactions with the surrounding nuclei (The donors of 29Si and the Halide color centers). The Vij allow a spin to flip and P(E) is linear. The Anderson method is to put a single spin on site n at t =0 and look at the wave function at any later time. He restates his theorem as follows “if V(rjk) falls off at large distances faster than 1/r3, and if the average value of V is less than a certain critical Vc of the order of magnitude W; then there is actually no transport at all, in the sense the even as t -> infinity the amplitude of the wave function around site n falls off rapidly with distance, the amplitude on site n itself remaining finite.” There is no transport because of a matching issue. The probability of finding other sites with the right energy for transport increases much more slowly than the strength of the interaction V(rjk) as a function of distance. Anderson also mentions the two regimes where Anderson Localization doesn’t occur and hence transport is allowed. Where V falls off as 1/r3 (“strong” interactions) and V~W (“high” densities). Suppose |aj(0)|2 is known and localized to a certain region of Ej or rj. The question is, how fast (if it even occurs) does this probability distribution diffuse away from this region? The simplest case is to say that for the j = 0, a0(0) = 1 and ask for aj(t). Also lim(s*fj(s), s-> 0+) = <aj(∞)>Av. This problem is solved by iteration. Equation 4 is solved in terms of f0(s) (for the equations which didn’t involve f0(s)). 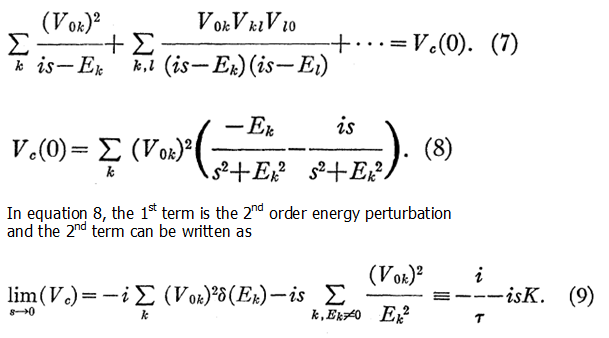 In this case, the energy is the same as in equation 10A, but this energy state doesn’t decay. The amplitude a0(∞) is reduced from unity by 1/(1+K). K measures how much spread has occurred in the state to its neighbors by virtual transitions. But no real transport has occurred. Study equation 7 to look at the behavior of Vc(s). This variable is probabilistic. Pick a starting atom called 0 and arbitrary energy E (the imaginary part of s) and examine the probability distribution of Vc. 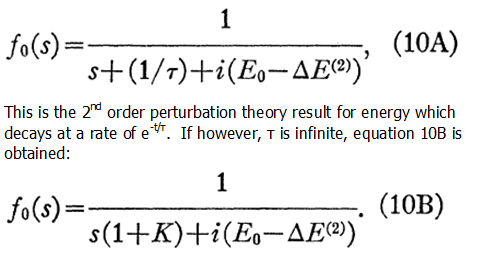 Anderson poses 3 questions/subjects of interest which become the thrust of much of the rest of his paper: study the 1st term of equation 8, look at the convergence of the series higher order perturbations (that is, beyond 2nd order), and if these convergences are meaningful (whether the arbitrary choice of energy is correct or not). Part two of this article is continued HERE.